Twelve new companies just hit the NY tech scene during today’s DreamIt Demo Day in midtown Manhattan. Ranging from a location-based messaging app, a cloud-based hotel management system and a service that makes pins on Pinterest shoppable, these companies took part in startup accelerator DreamIt‘s three-month program, which provides resources such as access to investor networks and funding to help them grow. Slidebean: Launched as a beta last November and with an official launch in June, Slidebean wants to speed up the time users take creating a PowerPoint or a presentation with a web tool by placing content first. The web tool prompts you to input content first with options to choose what kind of slides you want. Images can be uploaded or can be imported from Flickr’s Creative Commons, and videos can be embedded with one-click playback. After adding the content, you can design the slides by choosing from five different color palettes and five design options, which comes with animations. Slidebean gives you a link to share your presentation, which are all public and searchable. Slidebean is mobile-enabled and rendered as HTML5, and operates as a freemium model with certain features requiring a $4.99 monthly subscription. Investormill: Founded by former vice president of U.S. economics at Morgan Stanley and a former associate at J.P. Morgan, Investormill claims it is the “fastest way to find economic data from trusted sources.” The service aims to fix what they find wrong with current data services: navigation difficulties, required tech support and high prices. Investormill finds and charts economic data in an economist’s perspective and works through a subscription-as-a-service model. The company ended its 2-month free beta two weeks ago and implemented a pay wall, in the hopes to convert beta users into payers. The subscription is $140 a month per user, and $1,499 a year. Investormill started an angel round and has about $300,000 already committed. Browsy: If you’re interested in fashion and are an avid Pinterest user, Browsy might be the right service for you. Browsy is a board on Pinterest that’s trying to tap into the Pinterest market where users have the interest to purchase but cannot necessarily trace pinned items back to retailers. Once you give Browsy access to your pinned items, the service uses image recognition technology to connect those items to retail sites that sell it. The service gives you the lowest available price in a click. As the company hopes to expand, Browsy want to move their service off Pinterest’s platform and create a browser plugin to make all browsable content shoppable. Browsy takes 7 percent off every purchase, and 5 cents for every click through to a retailer’s site. Acorn: Founded by three high school friends, Acorn is a machine-learning social reminder app for iOS that relies on geographic locations. With the desire to be the IFTTT of the real world, Acorn’s founders wants actions to occur through location-tracking. For example, if you are heading to a location where it is raining, Acorn’s technology will remind you to grab an umbrella as you are leaving your house. You can add favorite locations such as your work and home, and friends using the app can “drop you acorns” when you arrive at a specific location. After doing a stress test with competitor Swarm, Acorn’s team found that their app used one percent of battery life per hour, while Swarm used up 20 to 24 percent. As more users join Acorn’s base, the battery life becomes better. Right now the app can send reminders, messages and pictures to yourself and others. Acorn is looking at two business models: one is a gamifyied experience geared at younger users where they will leave a clue that initiates a scavenger hunt scenario for deals, and the other is native advertising. Fiestah: Event planning can be a pain in the neck and Fiestah is looking to create a seamless way to help organizers and vendors work together. Fiestah, a subscription-as-a-service, is a marketplace focused on New York City where users can post event needs and will receive bids from various groups to work with them. If you ask for access to a photo booth for three hours, local vendors that can provide that space will bid you and you can choose where you want to work. Within 24 hours of posting, the user should receive about three to five proposals. Fiestah’s beta launched last year, but the company is looking to build deeper tools for its service. They’re raising $650,000 and are hoping for an official launch in the next six to twelve months. uVore: uVore is creating a mobile app that allows customers to order and pay for meals using their smartphones. If you’re heading to lunch from work, you can choose from a curated list of partnered restaurants, order and pay for your meal. The restaurant begins cooking your meal as soon as you order and all you have to do is pick it up. uVore is looking to launch its pilot program next week. Four restaurants between 39th and 43rd street will be available in midtown: Mangia Organics, Untamed Sandwiches, The Picnic Basket, and Sushi & Deli Box. uVore grabs a small part of the transaction for its service. Bar & Club Stats: Every time a driver’s license is scanned, Bar & Club Stats wants to create a data point. This company provides ID scanners and a scanning mobile app to casinos, clubs and bars, that validate ID’s for age and also creates demographic data that helps users better market their company or product to consumers. The scanned information is anonymous to Bar & Club Stats as all they see is the time of entry, age, gender and zip code, but it isn’t anonymous to your local bar, restaurant, or whoever is using Bar & Club Stats’ service. By selling the scanned data back to the company, clubs and bars can see in real time how their businesses are doing and what demographics they attract. Bar & Club Stats is also hoping to develop a consumer app, where users can figure out which bar or club to go to based on real time demographics and gender. Zairge: Frustrated with outdated software platforms for hotel management systems, Zairge wants to disrupt the hotel industry with its easy-to-use and cloud-based system. Zairge is a property management system, global distribution system liaison, point-of-sale system, food and beverage system, inventory tracker and housekeeping/maintenance platform — it pretty much wants to be the one software a hotel needs to operate. The service, which can be taught to an employee in a day, gives hotel managers real time analytics on what’s happening everywhere. Zairge is a mobile-enabled web-based service that stores data in the cloud and doesn’t require a server requiring maintenance. The company charges $5 per room per month for its service. Zairge, which began its beta six weeks ago with four hotels taking part, is focused on Virginia, but the company is looking to expand to New York, Houston and San Francisco. They are looking to raise $750,000, and $100,000 has already been committed. Tourlandish: When you’re traveling and looking up things to do in a city like New York, you usually hit Google or TripAdvisor. But as you navigate through different options, you have to separately find a way to book a tour you find interesting. Tourlandish is an iOS and Android app that acts as an on-demand marketplace that lets travelers book last-minute activities, tours, events and attractions to visit at discounted prices. Partnered tour providers give discounted prices for 24 hours each day, but these experience providers aren’t simply added to Tourlandish’s list because simply because of the service they provide. Tourlandish wants to curate and recommend tours the members themselves would want to take, and so local experience providers have to approach them to be considered for the app. The app has been live for six weeks, and the company, which is focusing on New York City at the moment, takes a percentage on every booking made. 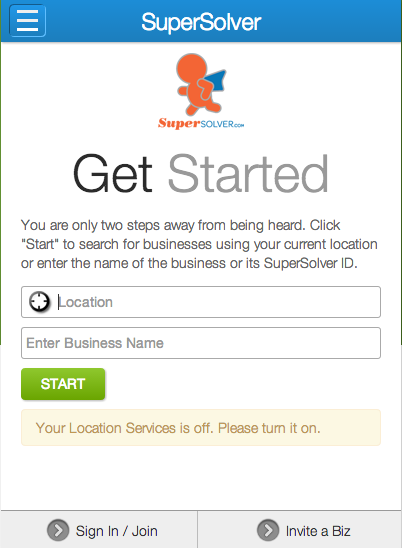 SuperSolver: If you have a problem with a business’ service, chances are you won’t really speak up and say anything about it. Nowadays, the practice is to leave negative reviews on Yelp or to shame the business on Twitter on Facebook, but that never truly solves the issue. Patent-pending system SuperSolver wants to be the best of both worlds for the consumer and for the business by allowing an anonymous way for the consumer to tell the business about their problem, and for the business to save itself from public shaming and fix it. Consumers can use SuperSolver through its app or web app and it allows the user to anonymously communicate with an owner or with senior management of an organization. If management doesn’t respond, the consumer can post the issue to Facebook and Twitter. Businesses can set up auto-replies for problems such as a faulty bathroom, and can customize these problem lists in any manner. SuperSolver launched last year and is raising $2 million in a Series A round. Picsell: If you have junk laying around that you’ve been too lazy to list on Ebay and sell, Picsell is right up your alley. All you have to do is take three pictures of the item you want to sell, add a description of it and send it to the company. Within 24 hours you’ll receive an offer for a price on how much the item is worth. Once you agree to that price, Picsell will list your item on sites like Amazon and Ebay. When it is sold, you receive a pre-paid shipping label and will get paid when it ships. The company takes 15 percent of the sale. Picsell is an iOS app at the moment but the company plans to move to Android in the future. 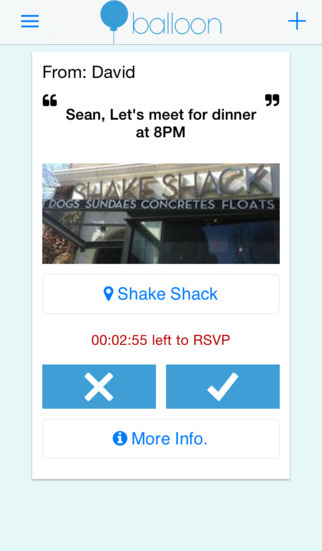 Balloon: Balloon is an iOS app that makes impromptu get-togethers easier. You can send out personalized invites that expire at a certain time set by you to groups of friends to join them at specific locations. 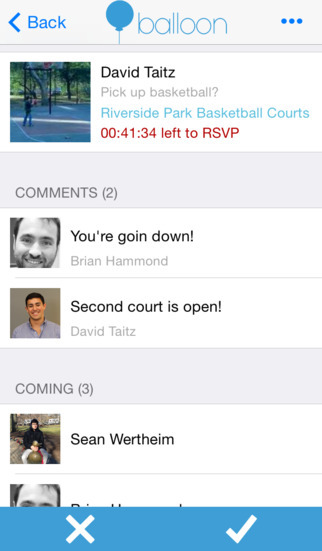 Nearby group members get push message invitations and can see who’s going, RSVP and attend. Update: Balloon backed out from presenting at the last minute.